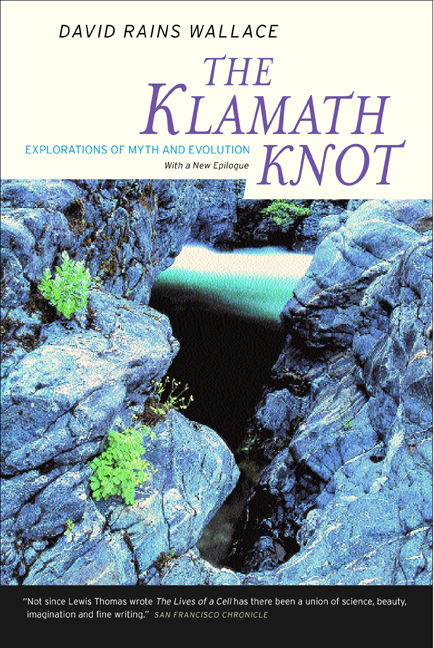 Winner of the John Burroughs Medal for Nature Writing, the Commonwealth Club Silver Medal for Literature 1984, and named one of the twentieth century's best nonfiction books by the San Francisco Chronicle, The Klamath Knot, originally published by Sierra Club Books in 1983, is a personal vision of wilderness in the Klamath Mountains of northwest California and southwest Oregon, seen through the lens of "evolutionary mythology." David Rains Wallace uses his explorations of the diverse ecosystems in this region to ponder the role of evolution and myth in our culture. The author's new epilogue makes a case for the creation of a new park to safeguard this exceptionally rich storehouse of relict species and evolutionary stories, which has largely been bypassed by conservationists since John Muir. David Rains Wallace is the author of over a dozen books, including The Bonehunter's Revenge: Dinosaurs, Greed, and the Greatest Scientific Feud of the Gilded Age (1999), The Monkey's Bridge: Mysteries of Evolution in Central America (1997), and The Quetzal and the Macaw: The Story of Costa Rica's National Parks (1992).